1285198050 -This trusted, best-selling text has become an essential, invaluable resource for clinicians, instructors, and students in the dynamic field of speech-language pathology. Accessible, visually engaging, and easy to navigate, this highly practical manual provides comprehensive coverage of a wide range of disorders and the procedures and materials used in their diagnosis, evaluation, and treatment in both pediatric and adult populations. 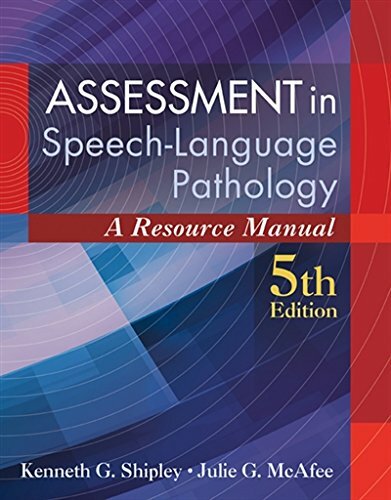 Now better than ever, ASSESSMENT IN SPEECH-LANGUAGE PATHOLOGY: A RESOURCE MANUAL, 5E, is completely current, with new and updated content in every chapter reflecting the latest research, best practices, and important trends and developments. Highlights include new chapters on autism spectrum disorders and assessment of clients who require augmentative and alternative communication (AAC), and a new chapter dedicated to norms, charts, and reference tables. In addition, the authors have significantly revised chapters on voice disorders and the foundations of assessment and added new material on childhood apraxia of speech, apps, online test sites, and electronic media. Also new to the Fifth edition, the text’s vast collection of forms for obtaining, interpreting, and reporting assessment data are now available online, making them even easier to customize, reproduce, and use in the classroom or a wide variety of clinical settings.